The way in which you view the world has a dramatic impact on the decisions you make. Case in point. If you view something as an expense, you see it as a weakness – a necessary evil to be minimized. You cut and cut and cut in hopes of doing enough to make something continue to work or operate, but you certainly do not do more. In this worldview, the expenses are bad and more of them is worse. By contrast if you view something as an investment you see it as a strength that you’ll seek to maximize. Provided returns are strong, if something is perceived as an investment you devote time, talent, and treasure into cultivating and growing it. You understand that an investment is in essence putting off a little bit of short term happiness for a much larger amount of future happiness. Investing takes the discipline of placing important long term goals over short term gains. In the one view a weight is heavy and ought to be lightened or not picked up at all, because doing so requires energy that must be conserved. In the other view a weight is a challenge that if carried today will yield greater future strength, expanding the capacity for growth. Neither of these views is inherently wrong, and yet they will lead you to radically different conclusions about what paths to follow, what decisions to make, and what you believe. Last week I wrote about my personal gratitude and appreciation for the teachers of Springboro. I wrote the post as a simple way to say thank you for the incredible job these professionals have done teaching my children. It is through my experience that I view the teachers and education system of Springboro as a worthy investment – a strength that should be maximized to differentiate the community. Today comes data that validates my personal experience, as the State of Ohio released the top 50 school districts in the Dayton area based on performance data. While I am no fan of standardized testing, this data shows that the teachers of Springboro are doing an incredible job. Of the top 50, Springboro placed #4. The district scored a 26 out of 26 in meeting state indicators and 107.2 composite score. More impressively they are doing in with a board that appears to view them primarily as an expense to me minimized. Rumors abound in our community about the desires of our school board. On any given day I hear things like: They are pushing teachers to strike and hopeful they will so they can replace them with less expensive teachers. They want the operating levies to fail so they can have the state run the district. They want to eliminate science, or sports, or arts, or music, or other programs. They are pushing for charter schools while serving on the board of public schools. They want to crush parental influence by implementing draconian rules and restrictions on volunteer organizations over which they have no real authority. They want to cut teachers, close buildings, reduce expenses, and do just enough to comply. I don’t know enough about any of these rumors to comment on their validity, but I do know this. I believe in Springboro schools, and I view them as a worthy investment. They are a big part of why people choose to live in the community. They help maintain property values. They are a source of civic pride. They help unite and define what Springboro is and aspires to be. The teachers there are smart, dedicated, and as the data shows, incredibly good at what they do. Springboro schools are ensuring the future viability of our community and opportunity for our children. There are some who want to create a story that reinforces a worldview that is about managing an expense, minimizing a problem, and cutting anything and everything possible within their power. There are others like me who view the schools as one of the most unique and promising resources the community has to offer – something we should seek to grow, enhance, and maximize. I base my story on what I see, and I am choosing to share my worldview with you in hopes of offering up an alternate narrative. If you believe in the story I believe in, I hope you will begin to speak up and make your voice heard. 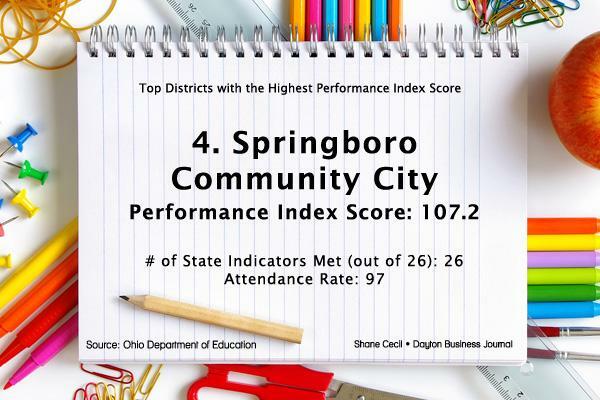 Congratulations to the teachers and students of Springboro for achieving such a great accomplishment. You continue to define Panther Pride for parents like me. Filed Under: FEATURED, LIFE // Tagged: Education, springboro, springboro schools.